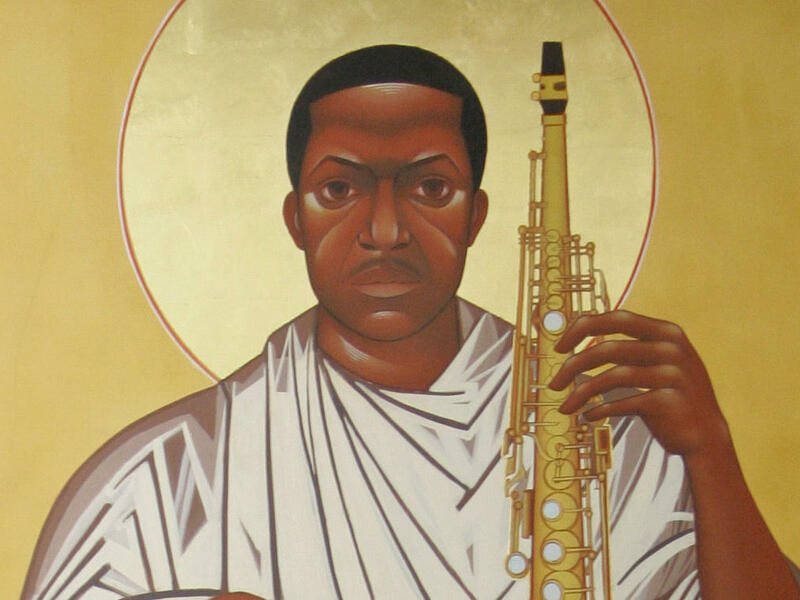 In this 2008 file photo, a painting of John Coltrane stares down from the wall at the Saint John Coltrane African Orthodox Church in San Francisco. The church went up as a way to worship the spiritual quality of Coltrane's music, through what King calls the holy trinity of melody, harmony and rhythm. "From the very beginning of the church, we wanted everybody to know about this evolved, transcendent being that came in this time and this age with a new testament message that wasn't about division, and as Coltrane would say, 'living clean and doing right,' " King says. He says gentrification has played a role pushing them and others out of the area. "I think it's about profit mainly," King says. This week, Sunday services were held as usual, beginning with a guided meditation on Coltrane's A Love Supreme. The Fillmore District of San Francisco was once known as the Harlem of the West for its rich African-American culture and jazz roots. This week, the neighborhood's beloved Saint John Coltrane African Orthodox Church may be forced to find a new home. FRANZO WAYNE KING, SR.: The church is almost like going to Jerusalem or going to Mecca, so people pilgrim here from all over the globe. WESTERVELT: That's Archbishop Franzo Wayne King Sr., who co-founded the church of John Coltrane devotees in 1969 as a way to worship the spiritual quality of Coltrane's music through what he calls the holy trinity of melody, harmony and rhythm. KING, SR.: From the very beginning of the church, we wanted everybody to know about this evolved, transcendent being that came in this time and this age with a New Testament message that wasn't about division, and as Coltrane would say, living clean and doing right. WESTERVELT: The city of San Francisco has told the congregation to vacate their small storefront building on Fillmore Street by Wednesday. Archbishop King is trying to get the courts to stop the eviction and give his church time to settle charges of unpaid rent. He says gentrification has played a role pushing them and others out of the area. KING, SR.: I think it's about profit, mainly. WESTERVELT: This week's Sunday services were held as usual, beginning with a guided meditation on what they consider their Bible, Coltrane's "A Love Supreme." WESTERVELT: Rev. King is trying to look on the bright side. He has plans to open a Coltrane university and study center that would be impossible at their small Fillmore Street storefront. Until then, he's calling on the city to protect the neighborhood institution. KING, SR.: This is a global spiritual community, so it belongs to the world. But San Francisco is the custodians of this. And officials in this city, from the supervisors to the mayor, should feel the responsibility to protect the house of a love supreme.